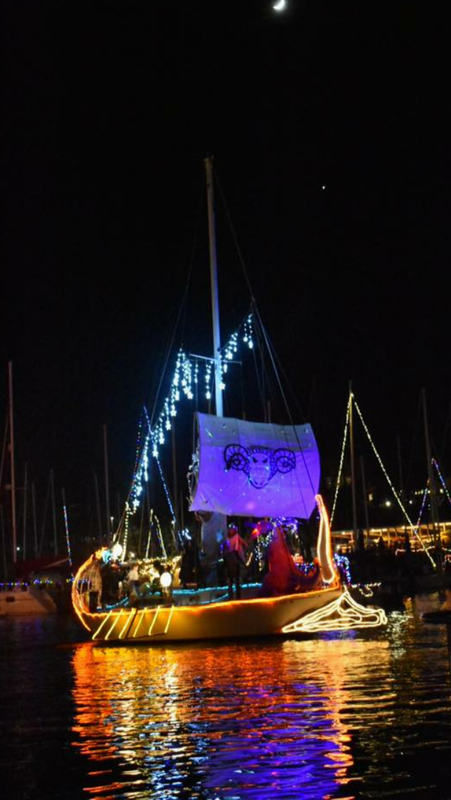 The UC Santa Cruz Community Sailing Club transformed its 32-foot sailboat into a mythical Greek sailing vessel, winning Best in Show in the 2016 Lighted Boat Parade. The UC Santa Cruz Community Sailing Club captured Best in Show at the Santa Cruz Lighted Boat Parade Dec. 3. The parade has been a regular event at the Santa Cruz Small Craft Harbor for decades. UCSC has won best in show for the third consecutive year. Club members transformed their 32-foot sailboat into a Greek sailing vessel, the Argo. After watching the 1963 film Jason and the Argonauts, they were inspired by Jason’s quest to find the magical Golden Fleece and save his kingdom. Aided by gods Zeus, Hera, and Poseidon, and after battling monsters and harsh seas, their quest was fulfilled and peace once again descended upon the kingdom as they battled to protect the citizens of Santa Cruz from monsters beyond the harbor entrance. Club membership consists of a diverse group of students and community members who love to sail and is part of the University Boating Center, whose mission is to promote the sport of sailing through education, community engagement, and competition.